When was the last time you tried to cut something and it didn’t end up looking very good? Probably not that long ago, right? Well, that’s because standard knives (or even some custom knives) just can’t get the quick sawing motion that an electric knife can. What that means is you’ll never get as good of a cut with a heavy duty manual knife as an electric one or even a cordless electric knife. Okay, so maybe we shouldn’t say never. It’s possible that you have some kind of amazing skills that we’ve never seen before and maybe you can do it, but it’ll be a whole lot easier with these electric knife reviews. The first thing that you need to do if you’re even considering buying an electric knife is look at the different features and options. You need to know what there is out there, right? So, we’re going to take a little time looking at each of the different features so you can figure out why it’s going to be a good investment. Keep in mind that an electric knife is definitely going to be a versatile tool and it’s one that you definitely won’t understand just how invaluable it is until you’ve used it. Take a few minutes to look at our buying guide and you’re definitely going to be glad you did. Take the time to pick out your own and try it out in your house and you may just wonder why you never bought one before. So, let’s take a look at the most important features when you’re considering getting an electric knife for yourself. Whether you need something solely for special occasions or something that you’re going to use every day you want quality and that’s what we’re going to help you find. We’ll take a look at some of the top features including: corded vs. cordless, blade material, overall style, handle style, blade style, comfort & release/swap features. Once we get you through the rest of the buying guide you’ll also find a list of some of our favorite options when it comes to heavy-duty electric knives so you can jump right into picking out yours and getting to that great new meal. Think about just how you’re going to be using your knife and also about the layout of your kitchen (or dining room if you’re going to be carving up meats there). Is there a power outlet nearby that’s easy for you to use? Or maybe you’re going to be traveling frequently and want the ability to take the knife with you and not worry about whether or not there’s power nearby. Well, you’re in luck, because electric knives come in both corded and cordless options. A corded knife is going to give you continuous power, which means you don’t have to worry about how much you need to carve. It will continue to operate and continue to get power for as long as you need it (unless the power goes out). It’s also going to give you continuous, smooth operation. In general, these seem to provide a little better power and capability, though that could be up to your own personal preference. A cordless knife is going to give you a bit more freedom when it comes to movement, travel or where you’re going to use the knife. You’ll be able to take it with you without having to worry about where the power is. You’ll be able to plug it in and charge it whenever you want and you don’t have to worry about a cord while you’re cutting. On the other hand, you won’t necessarily have consistent power as the battery dies and you could find that you run out of power before you’re done. The material of your blades is going to be crucial because this is what’s actually going to give your knife some power. With a subpar blade, it’s not going to matter what else you have as far as quality or strength. Stainless steel is a great material because it gives you strength and durability while still being lightweight at the same time. You’ll get the best of both worlds. This is actually about several different aspects. You want to look at the style of your knife from different pieces, after all. The first is the blade itself because you may want a different type of blade. While your electric knife can cut through bread or meat, you’ll generally want different blades for each of these, so look at which feature you want first. Next, the style of the handle is crucial because you’re going to be holding it for an extended period. You want something that’s going to feel good in your hand, not just because of the actual grip itself, but because it’s electric. That means the knife itself will vibrate while it’s in use and the more ergonomic and comfortable the handle is the less you’re going to feel that vibration and the less you’re going to experience the numbness or aching that tend to go along with it. Finally, look at how the blades actually snap in and out of the knife itself. If you’re going to be switching between different blades for different purposes you want something that you can do so easily with, right? Some of these types of knives actually have a quick release button that makes it super simple to release one blade and then attach the new one. While this isn’t a necessity, it’s definitely a feature that you’re going to want to look at. Now that you know what criteria you need to look for when you are buying an electric knife, let’s take a look at some of our favorites. All of the following models have been hand picked as some of our favorites. It’s worth noting that there are plenty of electric knives that will “get the job done” – but at the same time, you want to own the knives that have the best overall customer satisfaction ratings, that are also going to carry the longest amount of longevity after you make your investment. The five below are our top picks – let’s jump in. This carving knife comes with a case that helps you keep everything together even when you’re not using it (so there’s no fumbling around your kitchen when you want it for anything). This also makes it a whole lot easier for you to transport the knife itself because everything you need is safely stored for travel. It comes with a stainless steel blade that’s made to cut through different types of meat as well as bread and a stainless steel fork that helps hold everything in place during use. When it’s time to clean you’ll be able to do so easily with the quick release blade that wipes clean with no problem. The fork is also easy to wash and get right back to using again. 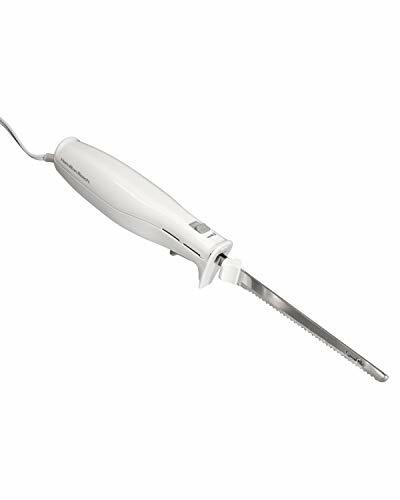 The handle on each piece is ergonomic, making it easy to hold onto while you carve and this corded knife oscillates quickly to get a sharp cut. You’ll never need to sharpen the blade and you’ll always have consistent power when you’re looking to carve anything and everything for your next meal with the family. This 9” knife is made with a stainless steel blade that resists rust as well as other damage. 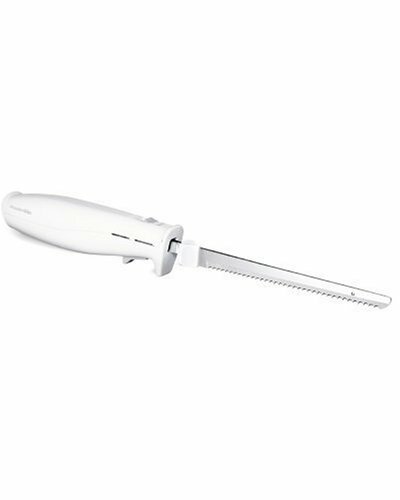 It also features a comfort, ergonomic handle to provide more control while you’re slicing as well as keeping your hand more comfortable even though the repetitive motion of the blade. The really nice part is that the removable parts are dishwasher safe so you don’t have to worry about hand washing when your knife is ready to be cleaned. When you’re ready to remove the blade there’s also a quick release feature that unlocks the blade. You get two blades, which are designed to cut through anything you need, from meat and bread to foam and more. You’ll also never need to sharpen them, which is an added bonus. When you’re ready to switch blades you can do so safely with the non-slip tabs and when you’re not using the knife you can cover the blade and set it down safely with the handle acting as a knife stand. This corded knife uses an intuitive trigger that turns the blade on and off for accurate use. This system is definitely going to give you something unique but stylish as well. The knife itself comes with a block that holds everything. The stainless steel blades are BPA-free and you get two of them, one for bread and one carving blade. They each fit into their own section on the block, as does the handle unit. 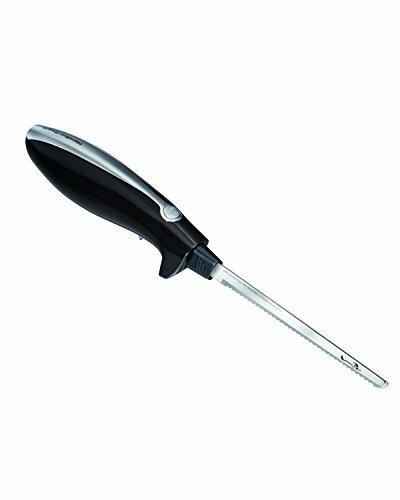 When you’re ready to use it you can easily snap one of the blades into the handle and you’re ready to go. Simply plug it in. The handle is ergonomic and built to North American Electrical Standards, so you know it’s safe and durable. This corded knife is easy to use whenever you want and when you don’t you can easily put all the pieces away so it’s safer in your home. There’s a one-touch control that turns it on and off whenever you want and it’s designed to work for right- or left-handed users. Lock or unlock the safety with just the push of a button, to keep you and everyone around you even safer. There’s even a safety lock that holds the blades onto the wooden block until you’re ready to remove them so they’re safe from drops or those who shouldn’t be playing with them. 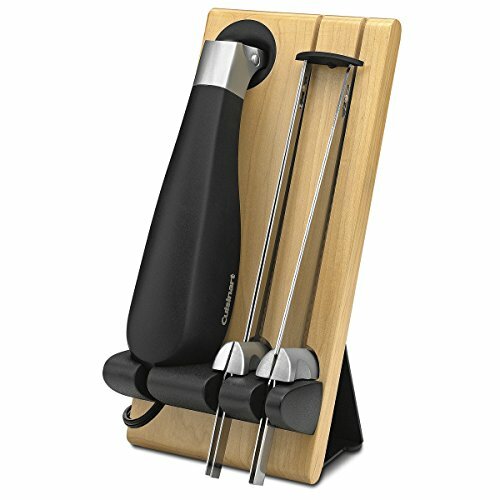 With this system, you’re going to get the knife as well as a fork that makes it a whole lot easier to hold your meats while you’re slicing. The blade is made of stainless steel, as are the tines of the fork, so you’ll get durability without the danger of rusting. 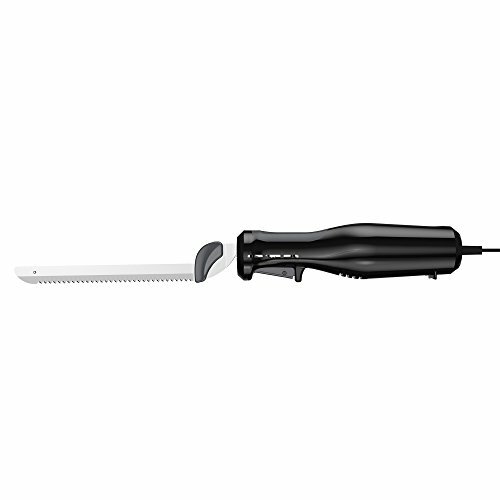 Designed for cutting through meat as well as bread, there’s also a non-slip trigger to the knife itself, so you can continue slicing without having to worry about slipping. Not to mention the entire system is corded so you’ll never run out of power. A case is included with the set so everything is together when you need it and it’s all built to North American Electrical Standards—so you can feel safe using it. You won’t ever need to sharpen it and when it comes time for cleaning you can easily remove the blade whenever you want. All you have to do is put everything away in the included case and you’re going to be ready to go, wherever you want to use it or take it along with you. Finally, we have this knife, which offers stainless steel blades as well as a hand-contoured grip. You’ll feel very comfortable holding this knife for an extended period and it can be used by those who are right- or left-handed. It has a touch button control that’s easy to operate so all you need to do is push it and you’re going to be ready to go, just like that. Built to North American Electrical Standards, you can feel safe using this knife in your home and with your family. The entire knife system is lightweight, so it’s easy to hold and you can cut through anything that you want, from meat and cheese to bread and any other food. You’ll have the precise control that you’re looking for and the corded aspect means that you’re never going to run out of power while you’re using the knife. Overall, you’re going to have a great knife no matter which of these you choose. Of course, if you’re not entirely sold on any of our top picks you now know what you should be looking for when it comes to choosing your own. So make sure you take a look at what we’ve found and then take a look at the different features we’ve mentioned to see if something else catches your eye instead. You’re definitely going to be impressed (and pleased) with how much an electric knife is going to change the way you cook and serve meals in your household. Whether it’s a new everyday tool or not.